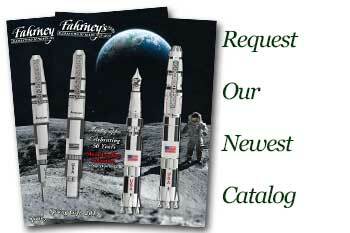 Order your Sheaffer Ferrari Intensity Fountain Pen today from FahrneysPens.com. Fine Pens, Refills & Luxurious Gifts – great prices & fast shipping. Sheaffer and Scuderia Ferrari join forces to present Ferrari Official Licensed writing instruments. The premium pens reflect the passion and expertise that drives the Scuderia Ferrari Racing Team. The bold, sleek Sheaffer Intensity model is created with the highest level of quality and proudly displays the Scuderia Ferrari Shield and Sheaffer White Dot on the clip. The Carbon Fiber surface has a highgloss finish with polished chrome trim. Fountain pen has a smooth steel Sheaffer nib; also in capped rollerball and twist ball pen. Shipped in a Ferrari red gift box. Cartridge/converter fill. Due to small quantities, some sale items may be limited to one per customer, please. Prices good while supplies last.